Should I buy a home in 2014, or wait until spring? Thinking about putting off your dreams of a new home until spring? Don’t! Despite what people may say, late fall and early winter is still a great time to purchase a home, especially in 2014. If you know you’re ready to buy, there’s no sense in waiting for the market to get better. If you’re waiting for home prices to get even lower, don’t hold your breath anymore. We’ve already hit the bottom and prices are starting to rise again. According to economic experts polled for the Home Price Expectation Survey, home prices will continue to rise over the next five years—estimated between 11.2% and 27.8%. Don’t get us wrong—prices are still very favorable right now. But if you’re holding out for something lower, the signs show it’s probably not going to happen. Take advantage of great prices now before they rise. We’ve enjoyed historically low mortgage rates recently, and it’s been a great thing for homeowners. But experts (including Fannie May, Freddie Mac, The Mortgage Bankers Association, and the National Association of Realtors) are all predicting that rates will rise once again. The current rate is about 3.98%, but it may go as high as 5.1% by the end of 2015. This rise will have a significant impact on your monthly payments. Say you buy a house for $250,000. 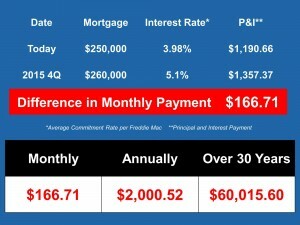 The difference between a 3.98% mortgage rate and 5.1% may be $166 a month (see the chart to the left). 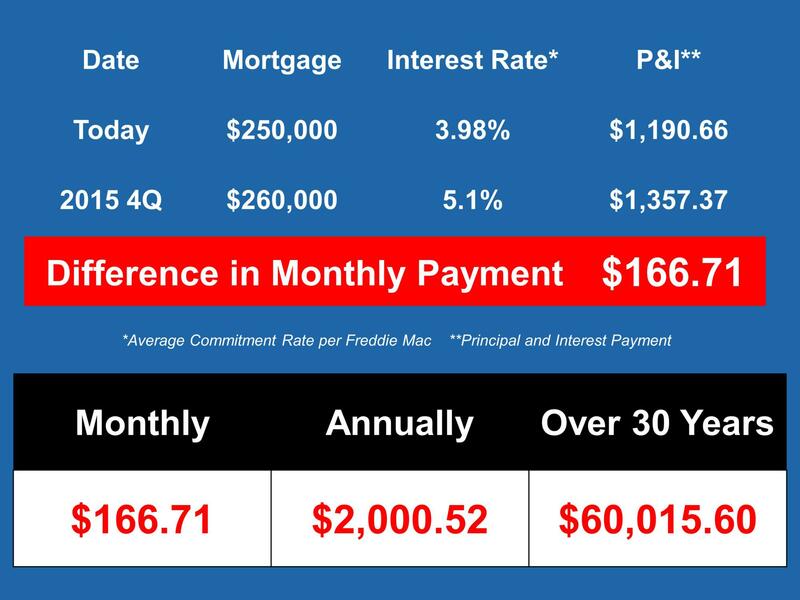 That’s $2,000 more a year, and ultimately $60,000 over the lifetime of your mortgage! 3. You’re paying someone’s mortgage—why not your own? While renting is a good choice in some situations (people who relocate frequently for work or need to share space with non-family members), it’s not always a smarter option than buying. Most people pay for housing each month regardless of whether they buy or rent—the question is how that payment benefits you. Ask yourself: why do you want to own a home in the first place? Chances are your answer goes beyond rates and prices to something deeper. There’s something about the prospect of owning your own home that is important to you—whether it’s a matter of personal freedom, a better experience for you and your family, or something else intangible. Take market prices and mortgage rates out of the equation for a moment and ask yourself: would you still wait? How long would you be willing to put off your dream, and what would change your mind? You don’t have to wait until the weather warms up to make your dreams of home a reality. 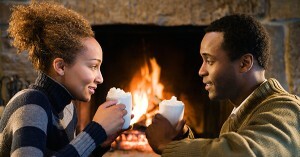 Get cozy in your own place this winter and reap the benefits. If you’re ready to start the adventure, give The Haro Group a call! We’ll be with you each step of the way.